Spending her summers in the south of France as a child, Alexandra Cousteau would walk from one tank to the next at The Oceanographic Museum with her grandfather, the famous explorer Jacques-Yves Cousteau. She asked myriad questions of Mr. Cousteau, who worked as director there. 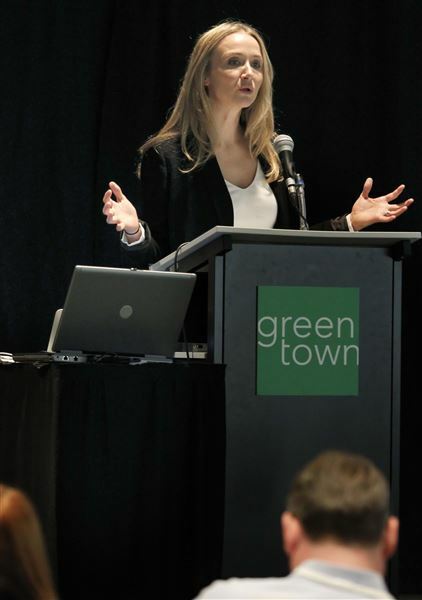 But while she learned to scuba dive at a young age, she shared her apprehension of leaping into unfamiliar water, as she gave one of the keynote addresses to Toledo-area leaders and advocates at Friday's GreenTown Conference. After taking what she described as “a few tentative breaths,” her grandfather grabbed her by the hand and they plunged into the deep blue together. Today, Ms. Cousteau is a filmmaker and a National Geographic Emerging Explorer who travels the country. While she has an urge to explore, she acknowledged that many of the magical sites she explored during her adolescent expeditions are largely gone from the modern environment. Knowing many of the exciting sites she toured were losing ground, Ms. Cousteau turned to storytelling as a medium to get her message out. “Storytelling is an incredibly powerful thing. Stories can change our world,” she said. Going on expeditions is a way of life for Ms. Cousteau, who enjoys traveling to new places and hearing new ideas. But because she didn’t want to create traditional documentaries, she decided to create an “interactive exploration” method. She and a crew of seven traveled for 100 days around the world in 2009, visiting places such as Israel, Australia, and Botswana. They posted rough cuts, short films, and daily blog posts to allow the rest of the world to accompany their journey virtually. But then a large environmental issue crept up on her radar — the global water crisis. Issues such as shifting climates and groundwater drying up have contributed to water loss. She and a crew of a dozen hit the road again and went out to discover what was happening with water, in the most unexpected places. Ms. Cousteau and her team traveled a span of 1,800 miles, from Canada to Mexico, starting their journey at the Colorado River. Three films came out of the work that was done along the river. Ms. Cousteau showed Limits to Growth during GreenTown to give attendees a look at Lake Mead, an artificial reservoir on the Colorado. The Hoover Dam was also showcased during the film. Connecting the dots back to responsibility, she said local sources are also important factors for environmentalists to consider. After an audience member asked Ms. Cousteau about the Maumee River, tying her speech back to the Toledo area, she called on the help of Sandy Bihn, Lake Erie Waterkeeper executive director, to provide some details about the state of the local watershed. Ms. Bihn said part of the problem is that most people don’t understand rivers and that there are multiple issues facing river conservancy, including agricultural issues and wastewater problems. The 137-mile Maumee, flowing from the confluence of the St. Mary and St. Joseph rivers in Fort Wayne, Ind., to Lake Erie at Toledo, is “is a shallow, muddy river. It is the fishiest river in the Great Lakes,” Ms. Bihn said. Locally, three groups meet and work on river quality awareness: Lake Erie Waterkeeper, the Lake Erie Center of the University of Toledo, and Partners for Clean Streams. While Ms. Cousteau urged audience members to get involved with one of the water groups, she also wanted the audience to know that powerlessness is not an option. Do you love the oceans? Ever wanted to be an explorer?